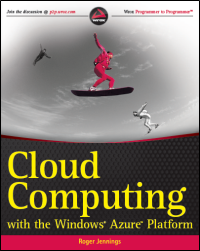 A compendium of Windows Azure, Service Bus, EAI & EDI,Access Control, Connect, SQL Azure Database, and other cloud-computing articles. I suppose you have a Windows machine and a Linux machine. You want to get a blob directly from Blob storage to the Linux machine. On the Windows machine, use a tool like CloudXplorer to create a Shared Access Signature. Copy the shared access signature which is a URL with authorization to download the private blob. Check the start date, don’t add more time than 1 hour for the authorized download window (that would require a policy at the container level, which is more complicated). This technique could also be used to upload blobs, by creating a write shared access signature and use HTTP PUT instead of GET. I think we’ve moved well past the point of believing that “every service should be a workflow” and other things that I heard when Microsoft was first plugging their Workflow Foundation. However, there still seem to be many cases where executing a visually modeled workflow is useful. Specifically, they are very helpful when you have long running interactions that must retain state. When Microsoft revamped Workflow Services with the .NET 4.0 release, it became really simple to build workflows that were exposed as WCF services. But, despite all the “contract first” hoopla with WCF, Workflow Services were inexplicably left out of that. You couldn’t start the construction of a Workflow Service by designing a contract that described the operations and data payloads. That has all been rectified in .NET 4.5 as now developers can do true contract-first development with Workflow Services. In this blog post, I’ll show you how to build a contract-first Workflow Service, and, include a list of all the WCF contract properties that get respected by the workflow engine. First off, there is an MSDN article (How to: Create a workflow service that consumes an existing service contract) that touches on this, but there are no pictures and limited details, and my readers demand both, dammit. To begin with, I created a new Workflow Services project in Visual Studio 2012. Then, I chose to add a new class directly to the Workflow Services project. Within this new class filed, named IOrderService, I defined a new WCF service contract that included an operation that processes new orders. You can see below that I have one contract and two data payloads (“order” and “order confirmation”). Now which WCF service/operation/data/message/fault contract attributes are supported by the workflow engine? You can’t find that information from Microsoft at the moment, so I reached out to the product team, and they generously shared the content below. You can see that a good portion of the contract attributes are supported, but there are a number of key ones (e.g. callback and session) that won’t make it over. Also, from my own experimentation, you also can’t use the RESTful attributes like WebGet/WebInvoke. Service Contract CallbackContract No Gets or sets the type of callback contract when the contract is a duplex contract. ConfigurationName No Gets or sets the name used to locate the service in an application configuration file. HasProtectionLevel Yes Gets a value that indicates whether the member has a protection level assigned. Name Yes Gets or sets the name for the <portType> element in Web Services Description Language (WSDL). Namespace Yes Gets or sets the namespace of the <portType> element in Web Services Description Language (WSDL). ProtectionLevel Yes Specifies whether the binding for the contract must support the value of the ProtectionLevel property. SessionMode No Gets or sets whether sessions are allowed, not allowed or required. Operation Contract Action Yes Gets or sets the WS-Addressing action of the request message. AsyncPattern No Indicates that an operation is implemented asynchronously using a Begin<methodName> and End<methodName> method pair in a service contract. HasProtectionLevel Yes Gets a value that indicates whether the messages for this operation must be encrypted, signed, or both. IsInitiating No Gets or sets a value that indicates whether the method implements an operation that can initiate a session on the server(if such a session exists). IsOneWay Yes Gets or sets a value that indicates whether an operation returns a reply message. IsTerminating No Gets or sets a value that indicates whether the service operation causes the server to close the session after the reply message, if any, is sent. Name Yes Gets or sets the name of the operation. ProtectionLevel Yes Gets or sets a value that specifies whether the messages of an operation must be encrypted, signed, or both. ReplyAction Yes Gets or sets the value of the SOAP action for the reply message of the operation. Message Contract HasProtectionLevel Yes Gets a value that indicates whether the message has a protection level. IsWrapped Yes Gets or sets a value that specifies whether the message body has a wrapper element. ProtectionLevel No Gets or sets a value that specified whether the message must be encrypted, signed, or both. WrapperName Yes Gets or sets the name of the wrapper element of the message body. WrapperNamespace No Gets or sets the namespace of the message body wrapper element. Data Contract IsReference No Gets or sets a value that indicates whether to preserve object reference data. Name Yes Gets or sets the name of the data contract for the type. Namespace Yes Gets or sets the namespace for the data contract for the type. Fault Contract Action Yes Gets or sets the action of the SOAP fault message that is specified as part of the operation contract. DetailType Yes Gets the type of a serializable object that contains error information. HasProtectionLevel No Gets a value that indicates whether the SOAP fault message has a protection level assigned. Name No Gets or sets the name of the fault message in Web Services Description Language (WSDL). Namespace No Gets or sets the namespace of the SOAP fault. ProtectionLevel No Specifies the level of protection the SOAP fault requires from the binding. With the contract in place, I could then right-click the workflow project and choose to Import Service Contract. From here, I chose which interface to import. Notice that I can look inside my current project, or, browse any of the assemblies referenced in the project. After the WCF contract was imported, I got a notice that I “will see the generated activities in the toolbox after you rebuild the project.” Since I don’t mind following instructions, I rebuilt my project and looked at the Visual Studio toolbox. Nice! So now I could drag this shape onto my Workflow and check out how my WCF contract attributes got mapped over. First off, the “name” attribute of my contract operation (“SubmitOrder”) differed from the name of the operation itself (“Submit”). You can see here that the operation name of the Workflow Service correctly uses the attribute value, not the operation name. So maybe these attribute values only get reflected in the external contract, not the internal data types. Let’s find out! After starting the Workflow Service and inspecting the WSDL, sure enough, the “type” of the inbound request corresponds to the data contract attribute (“CustomerOrder”). In addition, the field (“ExtraField”) that I excluded from the data contract is also nowhere to be found in the type definition. Finally, the name and namespace of the service should reflect the values I defined in the service contract. And indeed they do. The target namespace of the service is the value I set in the contract, and the port type reflects the overall name of the service. All that’s left to do is test the service, which I did in the WCF Test Client. The service worked fine. That was easy. So if you have existing service contracts and want to use Workflow Services to model out the business logic, you can now do so. Thinktecture IdentityServer v2 Tutorial: Installation from thinktecture Videos on Vimeo. With the release of Infrastructure as a Service (IaaS) this summer there seems to suddenly be an increased interest for IT Pros in Windows Azure. Originally most of Azure's features, like Web and worker roles, were focused primarily upon developers. This accidentally led to Windows Azure being erroneously viewed by the IT Pro community as a chance for developers to bleed over into the roles of the IT Pro. It has also been viewed unfairly as a driver behind their jobs eventually going away. After all - if the Cloud handles all the deployment, installation, and patching of the core software, and provisioning of the hardware, what roles still exists for IT Pros in that environment? Once you get a better understanding of the types of opportunities that are created by the Cloud you can see that the theory of an obsolete IT Pro replaced by Windows Azure is not very realistic. For the IT Pro Azure VMs and Azure Web sites with the introduction of IaaS, Windows Azure is now also an ITPro platform. As an IT Pro it might help to think of Azure as an extension of your IT department. Over the next few posts I will be discussing concise Windows Azure tips and best practices for IT Pros. Let's start with our first topic - Deployment. With Windows Azure, developers can go right to Azure and deploy their applications. For your on-premise server you would not allow developers to do direct deployment to production. IT Pros need to take this control back! To manage deployment and keep developers from directly deploying from Visual Studio (they can also deploy with configuration files) create two Azure accounts - one account for development and one for production. Give them the development account to work with and do what they want. However, when they have to deploy to production they need to go through your account and you do it for them. When you deploy try to keep the Azure storage and code on the same location. You can create and use affinity groups to help with that. So if you have a market in the Far East you can easily deploy it all into the Far East. This is an advantage for deployment you get with the cloud. You cannot change a data center but you can choose a region of the world. The affinity group guarantees a hosted service and storage will be in the same datacenter. Group application pieces into a single deployment package when they must be hosted in the same data center. Note - you cannot use affinity groups with Windows Azure SQL Database. Closely related to the topic of deployment is the management of certificates in the Azure portal. Each subscription should have its own separate Azure service management certificate which is unique to that subscription. To use a management or service certificates it must be uploaded through the Windows Azure Platform Management Portal. Windows Azure uses both management certificates and service certificates. Management Certificates – Stored at the subscription level, these certificates are used to enable Windows Azure using the ‘management’ tools: SDK tools, the Windows Azure Tools for Visual Studio, or REST API calls. These certificates are independent of any hosted service or deployment. Typical IT policies define distinct roles for parties associated with application Development, Test, Integration, Deployment, and Production. These policies restrict roles from operations that exceed their defined responsibilities. Here are some suggestions on how to manage certificates for these roles. Development – Share a certificate between all the developers to allow freedom of development. Any other tips? Leave me a comment. There’s little question that today’s software developer must embrace cloud technologies to create compelling Windows Store applications—the sheer number of users and devices make that a no-brainer. More than one-third of the Earth’s population is connected to the Internet, and there are now more devices accessing online resources than there are people. Moreover, mobile data traffic grew 2.3-fold in 2011, more than doubling for the fourth year in a row. No matter how you look at it, you end up with a very simple conclusion: Modern applications require connectivity to the cloud. The value proposition of cloud computing is compelling. Most observers point to the scalability on demand and to the fact that you pay only for what you use as driving forces to cloud adoption. However, the cloud actually provides some essential technology in the world of multiple connected devices. Windows Store application users, likely to be using many applications and multiple devices, expect their data to be centrally located. If they save data on a Windows Phone device, it should also be immediately available on their tablets or any of their other devices, including iOS and Android devices. Windows Azure is the Microsoft public cloud platform, offering the biggest global reach and the most comprehensive service back end. It supports the use of multiple OS, language, database and tool options, providing automatic OS and service patching. The underlying network infrastructure offers automatic load balancing and resiliency to hardware failure. Last, but not least, Windows Azure supports a deployment model that enables developers to upgrade applications without downtime. The Web service application presented in this article can be hosted in one or more of Microsoft’s global cloud datacenters in a matter of minutes. Whether you’re building a to-do list application, a game or even a line-of-business accounting application, it’s possible to leverage the techniques in this article to support scenarios that rely on either permanently or occasionally connected clients. First, we’ll describe how to build a simple cloud-hosted service on Windows Azure to support asynchronous clients, regardless of the type of device it’s running on—phone, slate, tablet, laptop or desktop. Then we’ll show you how easy it is to call into a Web service from a Windows Store application to retrieve data. Generally speaking, there are two ways data can make its way into a Windows Store application. This article will focus on the “pull approach” for retrieving data, where the application needs to be running and data requests are issued via HTTP Web calls. The pull approach typically leverages open standards (HTTP, JSON, Representational State Transfer [REST]), and most—if not all—­device types from different vendors can take advantage of it. We won’t be covering the “push approach” in this article. This approach relies on Windows Push Notification Services (WNS), which allows cloud-hosted services to send unsolicited data to a Windows Store application. Such applications don’t need to be running in the foreground and there’s no guarantee of message delivery. For information about using WNS, see bit.ly/RSXomc. The full solution requires two main components: a server-side or Web services project (which can be deployed on-premises or in Windows Azure), and a client-side project, which consists of a Windows Store application based on the new Windows UI. Both projects can be created with Visual Studio 2012. Basically, there are two options for building the Web services project: Windows Communication Foundation (WCF) or the ASP.NET Web API, which is included with ASP.NET MVC 4. Because exposing services via WCF is widely documented, for our scenario we’ll use the more modern approach that the ASP.NET Web API brings to the table, truly embracing HTTP concepts (URIs and verbs). Also, this framework lets you create services that use more advanced HTTP features, such as request/response headers and hypermedia constructs. Both projects can be tested on a single machine during development. You can download the entire solution at archive.msdn.microsoft.com/mag201210AzureInsider. The most obvious starting point is that Windows 8 is required, and it should come as no surprise that the projects should be created using the latest release of Visual Studio, which can be downloaded at bit.ly/win8devtools. For the server-side project, you’ll need the latest Windows Azure SDK, which includes the necessary assemblies and tooling for creating cloud projects from within Visual Studio. You can download this SDK and related tooling at bit.ly/NlB5OB. You’ll also need a Windows Azure account. A free trial can be downloaded at bit.ly/azuretestdrive. Historically, SOAP has been used to architect Web services, but this article will focus on REST-style architectures. In short, REST is easier to use, carries a smaller payload and requires no special tooling. With these decisions made, we’re ready to create our Web service. Our goal is to build an HTTP-based service that reaches the broadest possible range of clients, including browsers and mobile devices. Click on the File menu and choose New | Project (see Figure 1). Select Visual C# | Web for the template type. Select .NET Framework 4 in the dropdown at the top. Select ASP.NET MVC 4 Web Application. Enter the Name WebService and a Location of your choice. The wizard will ask you to select the Project Template. Choose Web API and be sure the View engine is Razor (the default), as shown in Figure 2. A variety of files will be generated by Visual Studio. This can be overwhelming, but we only need to worry about a couple of files, as shown in Figure 3. … The authors continue with detailed instructions for completing the server and client components. Cloud computing is expanding rapidly, with an accompanying need for for cloud computing "experts" to make this technology work. That translates into many new jobs chasing very few qualified candidates. At the same time, many IT professionals are attempting to figure out how they can cash in on the cloud. Most of the cloud jobs to be found these days require deep knowledge around a particular technology, such as Amazon Web Services, OpenStack, Salesforce.com, or Azure. This is typically due to the fact that the company has standardized on a cloud technology. I call these jobs cloud technology specialists, in that they focus on a specific cloud technology: development, implementation, management, and so on. Others jobs would be cloud planning or architecture positions, often around the configuration of new systems in the cloud or the migration of existing systems to the cloud. I call these cloud planners. While you'd think candidates for this position would also be in demand, in most instances the listings are filled by existing IT staffers who understand full well that having cloud computing experience on their CV translates into larger paychecks going forward. You can't blame them. Those looking to break into cloud computing will have the best luck by learning a specific technology, then taking a cloud technology specialist job. The trick is getting the initial experience. The most ambitious candidates will begin their own "shadow IT" projects using a hot cloud computing technology, then soon find their way to a formal and high-paying cloud gig. Cloud computing is littered with stories about self-taught successes, due to the lack of formal training offered. Those seeking higher-level jobs such as cloud planners and architects won't entertain as many options, but they can be found. The best way to prepare for these jobs is to understand all you can about the technology, including use cases and existing architectural best practices and approaches. This past week we released several changes to the portal. As many of you know, we released the ‘new’ portal this past June. In that timeframe, there have been some features that were only still available in the ‘old’ portal. The new portal is based on HTML so that it is more cross-platform, lining up to support those developers who are using our new native Mac and Linux tools. Yay us! The old portal still uses Silverlight. Anyway, what is in this update? Service Bus Management and Monitoring – You can now manage all of your Service Bus needs from the new portal. Support for Managing Co-administrators – Many people create subscriptions under an accounting or ‘super admin’ live id, and then add their developers individual live id’s as co-admins. You can do this in the new portal now as well. It is under the settings tab. Import/Export support for SQL Databases – I love this feature. I can now, from the new portal, import and export the contents of my SQL Databases. The file format is BACPAC, which your normal, boring SQL Server fully understands. When you export, you will create the file in blob storage, which you can then download to your local machines. Virtual Machine Experience Enhancements – Now you can manage your VM disks when you manage your VM’s. In the new portal, you can delete a VM, and leave the disks in storage (for later use). If you want to delete the disks when you delete the VM because you are truly destroying everything (a sample machine for example), this will now be easier. Improved Cloud Service Status Notifications – In the new portal, it was hard to tell what was happening with instances for cloud services as they were changing state (coming online, updating, running out for cat food, etc.). This is now surfaced in the UI so you can be all up to date and stuff. Media Services Monitoring Support – We have the Media Services on Windows Azure, which let you run media encoding jobs. The new portal can now show you want the status of those jobs are. Storage Container Creation and Access Control Support – You have always been able to create storage accounts in the new portal, and manage the keys. We have now added the ability to create blob containers in a storage account, and set its permission level at creation from within the portal. This saves you from having to write some code to it. It is amazing how fast we are moving with Windows Azure. Keep you ear out for more features, more fun, and more awesome. I am a firm believe[r] that community events like Code Camps are one of the best investments you as a technologist can make in your own career. Where else can you learn about a myriad of topics – from beginner to advanced – and network with fellow developers, designers, architects, and IT professionals – FREE? Your next opportunity to make that investment is Boston Code Camp, being held on Saturday, October 20th, at the New England Research and Development Center (NERD) in Cambridge. The agenda isn’t quite yet complete - there’s still a brief window of opportunity to submit your own session - but here’s a subset of the nearly three dozen topics proposed so far. Attendance is free, thanks to sponsors like Telerik, ComponentOne, Bluefin Technical Services, and RGood Software, but do register for an accurate count for breakfast and lunch. The IT Pro camps have proved super-popular. One of them filled within 10 minutes of its announcement on the blogs of my colleagues Simon May and Andrew Fryer. SO there will be online sessions added to the schedule. These are running on the 30th and 31st October. There's been some interesting speculation involving a popular GPU vendor and a certain Internet-bookstore-turned-cloud-provider. According to this piece published on Oct. 4, Amazon purchased more than 10,000 NVIDIA Tesla K10 boards for its AWS EC2 cloud. While normally these boards, which pair two "Kepler" GK104 GPUs with 8GB of GDDR5 memory, sell for around $4,000, Amazon is said to have negotiated the price down to somewhere between $1,499 and $1,799 per card, bringing the total amount paid (or allegedly paid) into the $15 to $18 million range. But there's more: Amazon reportedly subscribed to a warranty program worth almost as much as the GPGPUs. For an extra $500 per board per year, NVIDIA will immediately replace any faulty units. The two-year deal brings the total contract price up to a cool $25-28 million. The author who made these detailed claims based them on "sources close to the company." He added that while NVIDIA was mainly interested in the single-precision K10s they're also looking at buying some K20 boards for the subset of HPC users who require double-precision performance. This K20 is the same GPU inside petascale behemoths like Titan and Blue Waters. It has a lower retail price of $3,199, but due to high demand, significant volume discounts are difficult to come by. If the buy happened, why not shout it from the rooftops? It's a win-win for both companies. For Amazon, it gives cred to the HPC cloud model and affirms the company's 2010 decision to enter the GPU supercomputing space. And for NVIDIA, this is a huge single-customer sale, even taking into account the volume discount. There's even speculation that NVIDIA's stock price has been influenced on the basis of this story alone. The level of detail in the source article belies the usual rumor mill pap. The author even mentioned that the boards "look a bit different" from the standard issue press photo. And there's a logic to the story – it certainly could be true. Still, this is essentially an unvetted piece, one that our source at NVIDIA denied and our AWS contact was unwilling to comment on. Perhaps NVIDIA and Amazon signed a non-disclosure agreement. Maybe one or both are planning a grand announcement and don't want to spoil the surprise. For the record, a number of NVIDIA partners are making the power of GPUs available as a service. Amazon Web Services, PEER1/Zunicore, Nimbix, SoftLayer and Penguin Computing all offer GPU-based supercomputing on-demand. As is stands now, Amazon's Cluster GPU Instance comes with a pair of NVIDIA Tesla M2050 "Fermi" chips, each of which contains 448 CUDA cores and offers 1.03 teraflops of single-precision floating point performance with 148 gigabytes per second of memory bandwidth. The Kepler architecture, which fits two Tesla K10 GPUs on a single accelerator board, has 3,072 cores total (1,536 per GPU) and delivers an aggregate 4.58 teraflops of single-precision performance and 320 gigabytes per second memory bandwidth. Amazon will need to upgrade its GPU offering sooner or later, and Kepler is the logical choice if they want to stay current to the needs of high-end users. Max Spevack of the Amazon EC2 team brings news of the latest Amazon Linux AMI. The Amazon Linux AMI 2012.09 is now available. After we removed the “Public Beta” tag from the Amazon Linux AMI last September, we’ve been on a six month release cycle focused on making sure that EC2 customers have a stable, secure, and simple Linux-based AMI that integrates well with other AWS offerings. Kernel 3.2.30: We have upgraded the kernel to version 3.2.30, which follows the 3.2.x kernel series that we introduced in the 2012.03 AMI. Apache 2.4 & PHP 5.4: This release supports multiple versions of both Apache and PHP, and they are engineered to work together in specific combinations. The first combination is the default, Apache 2.2 in conjunction with PHP 5.3, which are installed by running yum install httpd php. Based on customer requests, we support Apache 2.4 in conjunction with PHP 5.4 in the package repositories. These packages are accessed by running yum install httpd24 php54. OpenJDK 7: While OpenJDK 1.6 is still installed by default on the AMI, OpenJDK 1.7 is included in the package repositories, and available for installation. You can install it by running yum install java-1.7.0-openjdk. R 2.15: Also coming from your requests, we have added the R language to the Amazon Linux AMI. We are here to serve your statistical analysis needs! Simply yum install R and off you go. Multiple Interfaces & IP Addresses: Additional network interfaces attached while the instance is running are configured automatically. Secondary IP addresses are refreshed during DHCP lease renewal, and the related routing rules are updated. Multiple Versions of GCC: The default version of GCC that is available in the package repositories is GCC 4.6, which is a change from the 2012.03 AMI in which the default was GCC 4.4 and GCC 4.6 was shipped as an optional package. Furthermore, GCC 4.7 is available in the repositories. If you yum install gcc you will get GCC 4.6. For the other versions, either run yum install gcc44 or yum install gcc47. The Amazon Linux AMI 2012.09 is available for launch in all regions. Users of 2012.03, 2011.09, and 2011.02 versions of the Amazon Linux AMI can easily upgrade using yum. As always, if you need any help with the Amazon Linux AMI, don’t hesitate to post on the EC2 forum, and someone from the team will be happy to assist you.